I was in such a hurry to click these pics that I didn't really bother about cutting the muffins into halves to show you that it has a strawberry jam centre. It's there. Trust me. When you take a bite of these muffins, you will surely know. 1. Preheat the oven to 180C. Either line an 8 large hole muffin tray with muffin papers or grease little cake tins and dust it with flour. 2. In a bowl, sift the flour, baking powder, baking soda and salt. 3. In another bowl the sugar and add in the whisked yoghurt, milk, oil, vanilla and mix well. 4. Pour the wet ingredients into the dry ingredients, whisk lightly. Don’t overmix the batter. 5. Spoon the batter to the prepared tin halfway through. Add a teaspoon of the jam into half-filled batter, top it with little more muffin batter till it is 3/4th full. 6. Bake it in the preheated oven for 20-25 minutes until a skewer inserted comes out clean. 7. Transfer to wire rack and cool it. Let it cool completely before devouring it. Enjoy! 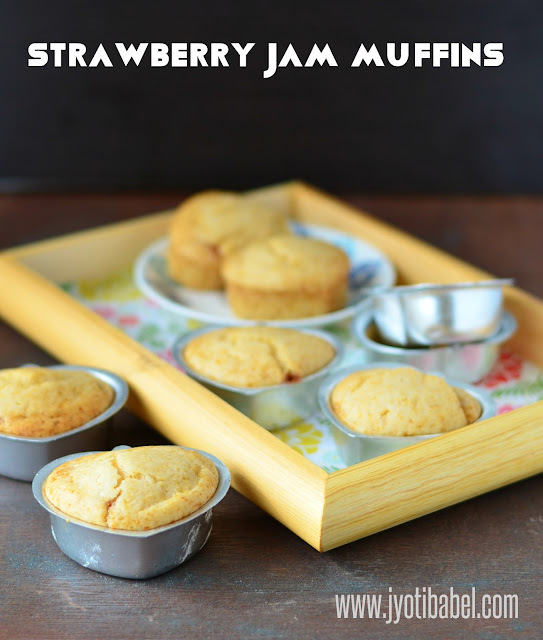 These cute strawberry jam muffins are so inviting Jyoti. Love those beautiful muffin moulds. Awesome share ! Jam filled muffins looks drool yummy. Drool worthy share. Jyoti, no matter how late you posted it, I am so in love with these muffins! So dont fret for the delay and I am so glad you participated with this gorgeous choice of recipe from Priya's blog. Life can be hectic with no help and a toddler and totally imagine your situation. The muffins look amazing and I would love to try it out someday. The eggless strawberry jam muffins sound so delicious ! Would love to give them a try sometime as I have a homemade strawberry jam lying in my refrigerator.Thanks for the share ! Love the heart shaped molds. I normally don't add jam to muffins, its a great idea especially when you want a fruity taste and don't get that fruit. Awesome bake Jyoti!Love the recipe! So sympathize with your maid-less state. I know what you mean even thought I have no toddlers. 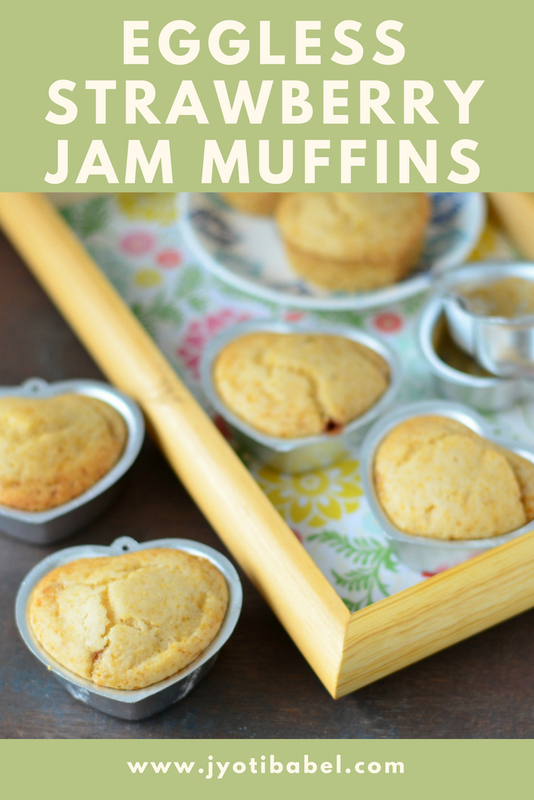 I love these muffins I have made them in the past and they are amazing.